Cleverly combining renewable heat with a fossil fuel back up, the Daikin Altherma Hybrid heat pump delivers the most efficient and cost-effective way to run your central heating system in all weather conditions. The Daikin Altherma Hybrid smart control automatically selects the most energy-efficient and cost-effective operation at all times, based on the users exact energy tariffs. 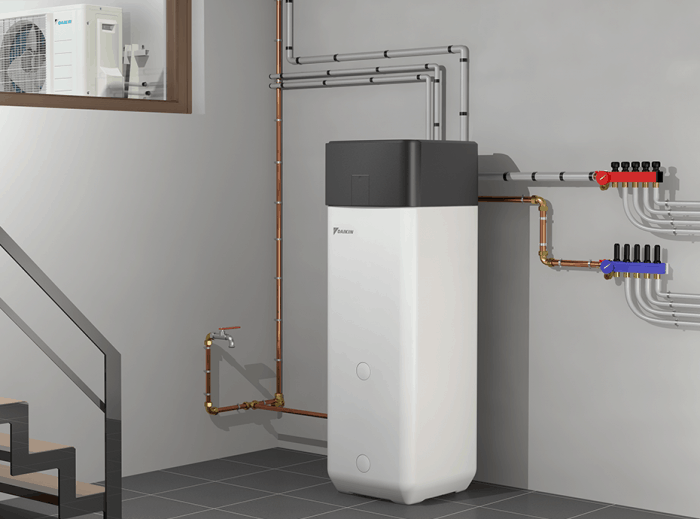 The Daikin Altherma Hybrid system is quite simply the most innovative smart solution for all your heating and hot water needs – and can simply be connected to your radiators to replace your existing boiler. The Hybrid system can also be fitted with underfloor heating. Delivers a flow temperature of up to 80oC. Up to 35% more efficient for space heating than a conventional new gas-fired combination boiler. Up to 60% more efficient for space heating than a conventional new LPG-fired combination boiler. Up to 15% more efficient for water heating than a conventional new gas-fired combination boiler. Up to 40% more efficient for water heating than a conventional new LPG-fired combination boiler. Eligible for domestic Renewable Heat Incentive (dRHI). As an MCS accredited renewable heating system, the Daikin Altherma Hybrid heat pump is eligible for funding from the domestic Renewable Heat Incentive (dRHI). The UK government also offer an interest free loan to bridge the gap between the costs of replacing your existing system with a renewable technology. Domestic Renewable Heat Incentive (dRHI) payments are based on the proportion of renewable heat generated from the heat pump. The dRHI payments are paid for a total of seven years and payments are released on a quarterly basis.